The brand Philips doesn’t need any introduction for Indian buyers. All the devices and appliances from Philips signify the trust, care, quality, and durability. And so you can purchase the Philips products blindly with full trust. This blog post covers the review of 7 best Philips Steam Irons that will make the tedious task of ironing more convenient and easier. Philips has engraved a niche for itself in the industry of household appliances, and irons are amongst them. Whether it is a dry iron, steam iron, cordless iron, or even garment steamer, Philips comes with an exclusive and latest range of all these products. Philips steam irons are the perfect pick for your optimum convenience and even an ease of ironing. Since the steam iron works excellently on most of the fabrics, Philips steam irons will absolutely be the great choice of yours for a crisp and neat wardrobe. Just go through the list of our best picked Philips Steam irons and choose the desirable one. 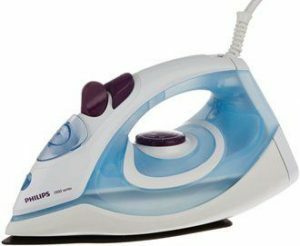 All the listed steam irons bearing the mark of Philips are absolutely of the best quality and ensuring durability as well. Looking for cordless irons? Best cordless steam irons. Now its time to get over the detailed review of each our best picked models to choose the one more easily and conveniently. 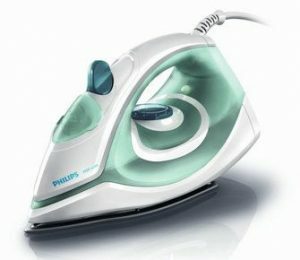 According to my personal experience, this is the best steam iron from Philips amongst the all listed in the blog. This steam iron is designed in such a way that automatically sets the right temperature, so you don’t have to struggle. It lets you iron any garment whether it is silk, linen, cotton, or any other fabric without adjusting the temperature and delivers he perfect results without the risk of burn or shine. This stylish steam iron comes with a light-weight design as well as the beautiful color combination. It provides a perfect combination of steam and temperature according to your needs. So, just get a quick and speedy ironing experience and most effective results on tough creases, without any settings or pressure during movement. This steam iron is also featured with smart control processor that sets the right temperature, and its heat flow technology enables even steam and temperature balance. Get the speedy ironing experience with the Philips GC3811/80 Azur Performer steam iron. This steam iron combines effective steam with ease of use as well as fast crease removal. It is also equipped with an auto steam control function that provides the right amount of steam for each type of fabric. This Philips steam iron comes with a premium SteamGlide Plus soleplate that ensures the effortless gliding over all types of fabrics. 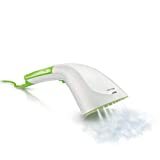 It is also featured with a powerful steam boost that helps you out in eliminating the most stubborn creases, and wrinkles from your clothes. The new GC1905 model is one of the comfortable and convenient Philips steam irons with loads of features. Get a quick ironing experience as this steam iron is specially built for speed. This sleek and stylish steam iron is feature packed with fast filling and emptying hole, linished soleplate, pointed tip, and smooth gliding that makes the ironing a very quick process. Its fine spray function dampens the clothes evenly and so making it easier to remove out toughest wrinkles and creases. The iron comes with a variable steam control knob to adjust the amount of heat being produced accordingly. This steam iron is also equipped with a lot of unique features like self-cleaning function, extra large pouring whole, and water spraying function, that makes it one of the best choices amongst other models of Philips steam irons. 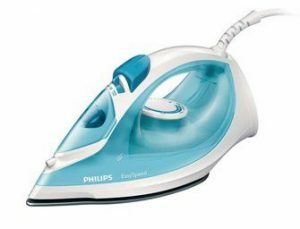 This steam iron is also one of the best model s of Philips steam irons. The model GC1010 gives you the quick and hassle free ironing experience and thus makes an ideal choice for daily use. Its unique and slim design lets you use this steam iron with ease. Also, its vent design emits uniform steam and ensuring exceptional results. This steam iron is also featured with a continuous steam function that allows you to iron your clothes even much quicker and faster. Its calc clean function flushes out the calc particles from your iron and preventing it from scale build up. Therefore extending the lifetime of your iron. 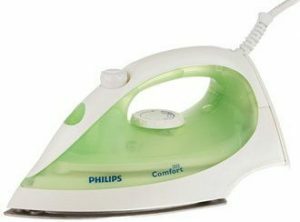 Want to get an iron with loads of good features and even without spending much more money. This steam iron from Philips will be your great pick that will make your job a whole lot easier. It is one of the best Philips Steam Irons that efficiently removes the creases and folds in a matter of minutes. Thanks to its Golden American Heritage soleplate that helps to use it conveniently. It also ensures the smooth gliding over all types of fabrics. Its lightweight design and the comfortable grip make your work a lot easier. Even you can easily hold for long sessions of ironing without any pain in your arms. The iron also delivers the continuous steam output for uniform heating and so effectively removes the toughest wrinkles of your fabric. This steam iron from Philips absolutely suits its name by offering the speediest ironing experience. Just forget to fight with the most stubborn wrinkles as well as water stains with this one of the best Philips steam irons. It comes with some of the most appealing features you desire in an iron. 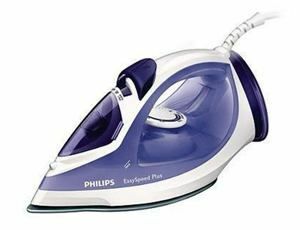 Featuring triple precision tip, continuous steam, and even heat distribution across the soleplate, this iron offers quick ironing. The ceramic coated soleplate enhances the appeal of the product and also ensures smooth gliding over all the fabric types. It is designed ergonomically that lets you use this steam iron with utmost ease. Its vertical steam feature also adds a great aspect to the convenience. 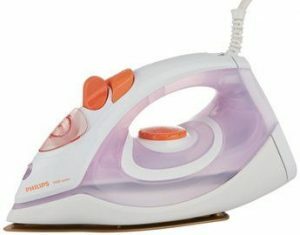 This steam iron from Philips will absolutely give you the fastest and quickest ironing experience without much effort. Featuring the linished soleplate and steam dispenser, this steam iron lets you remove the toughest wrinkles in no time. Its ergonomically designed handle enables the easy gripping. This steam iron is featured with the Black American Heritage linished soleplate that smoothly glides over all types of fabrics. The continuous steam output gives the perfect ironed clothes every time. 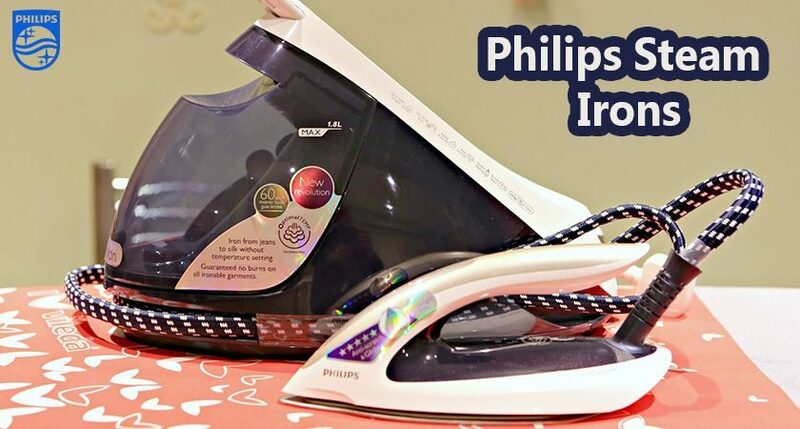 So get ready for easy and speedy ironing with this best Philips Steam iron. This is all about the best Philips Steam Irons. 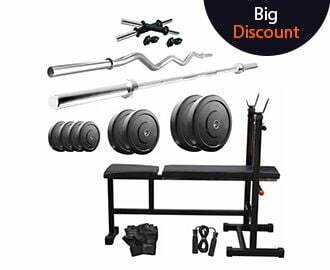 Being a trusted brand for good quality and service, it will absolutely be your good choice. So just take your pick from the above listed Philips steam irons and get a crisp and neat wardrobe. The impressive range of these Philips steam irons will surely meet up your daily needs.